includes a Sleek Compact Mirror for your beauty and travel needs. Nigelle ER Shampoo is for critical care for thermally reconditioned hair. Nigelle ER Shampoo and Nigelle ER Treatment work together to repair damage and lock in moisture that gives hair softness and shine. They even smooth out new growth so its easy to manage. With Nigelle ER, from roots to ends, your hair will always look naturally healthy. Nigelle ER Shampoo uses High Penetration Cholesterol and Aqua Amino Phytosterol to repair internal damage to make hair soft. Sugar Ester, Aqua Gultamic Acid Derivative, PE Derivative form and Aqua Veil to smooth out hair's surface and increase shine. Nigelle ER Hair Treatment is critical care for thermally reconditioned hair. Nigelle ER Shampoo and Nigelle ER Treatment work together to repair damage and lock in moisture that gives hair softness and shine. They even smooth out new growth so its easy to manage. With Nigelle ER, from roots to ends, your hair will always look naturally healthy. Nigelle ER Treatment uses High Penetration Cholesterol and Aqua Amino Phytosterol repair internal damage for hairÂs softness. Also, Sugar Ester, Aqua Gultamic Acid Derivative, and PE Derivative form an Aqua Veil to smooth out hairÂs surface and increase shine. Milbon Nigelle ER Shampoo and Nigelle ER Treatment work together to repair damage and lock in moisture that gives hair softness and shine. They even smooth out new growth so its easy to manage. With Nigelle ER, from roots to ends, your hair will always look naturally healthy. 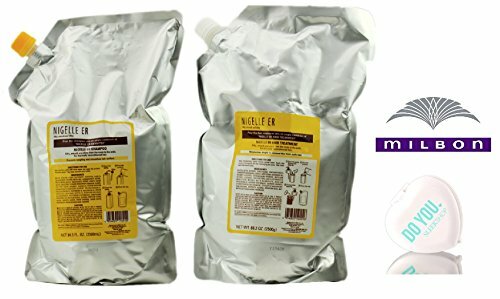 Milbon Nigelle ER Treatment uses High Penetration Cholesterol and Aqua Amino Phytosterol repair internal damage for hairÂs softness. Also, Sugar Ester, Aqua Gultamic Acid Derivative, and PE Derivative form an Aqua Veil to smooth out hairÂs surface and increase shine.